A. Flash your headlights to warn other drivers. B. Turn on your headlights, slow down, and double your following distance behind the vehicle in front. C. Turn your headlights on high beam. Correct. Your stopping distances will increase in the wet, and if visibility is impaired it may take you longer to react to an emergency situation. Other vehicles will not be able to see you as easily, therefore headlights are important. The hours of darkness, when you should have your headlights on, is usually defined as between half an hour after sunset to half an hour before sunrise. However, road rules in NSW dictate that you must turn on your headlights between sunset and sunrise. Some vehicles also have daytime running lights, however it's still a good idea to have headlights on, too. Certain colours of vehicles are well camouflaged against either roadside vegetation or the tarmac itself. 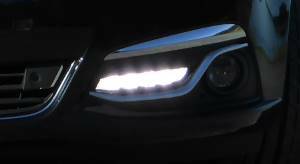 These daytime running lights are from a Holden Calais and are mounted low in the bumper. As they are low, they are obscured for longer if you are in a dip in the road and other vehicles are approaching the dip. Visibility will be reduced in heavily overcast days, when it's raining, and when it's dusk or dawn. If you can't see a person wearing dark clothing 100m away then it's dark enough for your headlights to be on. If it's raining then your stopping distances will increase, plus you will find it more difficult to see because it will be darker. Yellow tinted glasses can help in overcast scenarios as they filter the light to give things more contrast. Keep your lights clean to get the best performance out of them. If they are cloudy then you can often restore them with a mild abrasive like toothpaste. Bulbs can occasionally blow. Check your headlights and taillights regularly to make sure that you're getting the best visibility. If an indicator bulb blows, a tell-tale sign is your indicators flashing very rapidly. With the increase in LED-based lighting, there's less likely to be a lights failure as the LEDs are more reliable.